It's Halloweens Day again this 31st October, 2018 ! Given it's eerie theme of vampires, ghouls, witches, monsters, haunted houses and the like, it is a fun-filled day for both kids and adults in the US every year. As with any fun-filled day, this signifies spending and consumerism. Taking the cue restaurants too get an opportunity to spruce-up their menu and innovate on their decorations & partnerships to increase their sales and obtain a healthy bottom line. Approximately 175 million Americans would be spending on eating out with family and friends. Around $8.6 billion in sales is expected to happen in the restaurant industry. $86.67 will be the average spends per person across the US. $2.7 billion will be spend on candies,cakes and chocolates. $2.4 billion will be spend on costumes, which is a speciality on this day. $7.0 billion will be spent on decorations, particularly by restaurants and bars. Use digital signage menu board with suitable designs and content to suit the occasion. Create 'scary' names for menu items and design graphics such as witches, vampires, ghouls, skeletons and the like to convey the Halloween vibe and flair. Whether it's a bar or a restaurant, your offer must adjust to this holiday. If you can't search for something unusual , never mind. Just adjust your regular menu and be creative. Any food or drink with red color could be used. It is almost mandatory to have red tomato soup on your menu that you can name 'vampire's Blood'. Halloween menu inspired by fire. Cocktails which can be ignited pror to consumption, but done or demonstrated by the staff carefully. Flaming Cocaine, Flaming Blue blazer, Flaming Dragon and other mixed drinks that contain flammable, high-proof alchohol would be preferred. Even soft drinks such as Apple juice or Orange juice can look scary if decorated and designed with spiders cocoa powder or handsome sticks with skeletal motifs.Spagetti with with red sauce on this day gets called Slimy snakes and chicken wings as Bat wings. For dessert it is mandatory to serve pumpkin pie and attractive cup cakes called Zombies. Gum and sugar candies , which could be distributed free to the kids, could be decorated suitably as spiders, beetles, and skeletons. Offer discount coupons on your Halloween menu. Go for partnerships with the local costume store or a theatre where 'scary' movies are being shown on that day. The more incentives you offer, the better are your chances of enticing your customers. The Halloween festival depicts things which are dark, mysterious and sinister but with the intention of fun and frolic. Hence, for a restaurant promoting a food menu through dark images such as wiches, vampires, ghouls, skeletons and the like are indeed challenging. Create 'scary' but fun names for menu items and design graphics such as witches, vampires, ghouls, skeletons and the like to convey the Halloween vibe and flair. Videos and playlists can create the appropriate Halloween vibe and be a major source of entertainment for kids and adults alike with images of vampires , ghosts and the like along with the menu items. In in-store decorations, orange and black colors are ideal for Halloween. Arm your restaurant with pumpkins, knives and candles. Arrange for games with customers. Engage them in fun. Turn off the lights. Make the atmosphere mysterious. The kids will go crazy ! Have some magic with a few tricks.Decorate the dinner tables with candles. Use imagination . Some branches or dry leaves will do spendidly. You can stretch some white or grey net on the ceiling and bar, it will look like cobwebs. 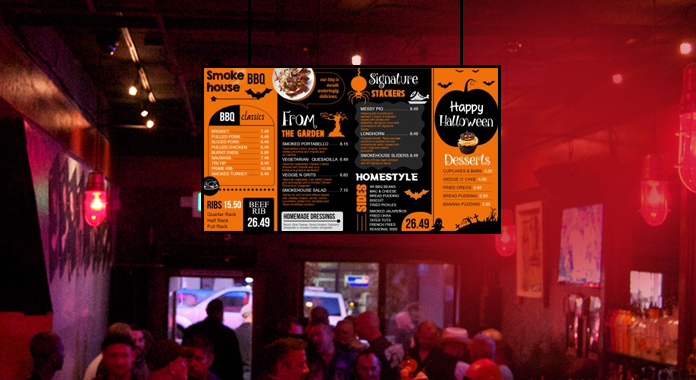 The more spooky you make your restaurant and project it on your Digital menu board the more attractive it will be for your target audience.